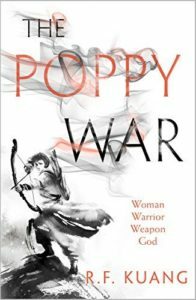 The Poppy War is the start of an epic fantasy trilogy by R F Kuang based on the historical wars of China and its neighbours in the twentieth century. We follow the orphan Rin as she learns to marshal terrible magical powers in a conflict between her homeland the Nikara Empire and the invading Federation of Mugen. It’s a story of wide scope, beginning modestly with Rin’s training at a military academy and proceeding through tribulation, darkness and mysticism to far-flung battlefields and genocide. The structure of the book is something of a suckerpunch. The first segment at the academy frames things in a familiar magical high school milieu. The latter sections covering war and magical destruction are much more archetypally grimdark in sensibility, with the academy being – in hindsight – a rather sheltered environment, which I think is a rather nifty transition. Although on a structural level the movement into darker material is well-handled, Kuang never quite captures this in her prose style. There is something faintly juvenile in the way everyone swears, as though even the adults have discovered cussing for the first time and have something to prove. Most of the novel follows events within hierarchical military organisations, but there is a stunning lack of formality to the tone and procedure of character interactions. One might reasonably argue that this would make for a less approachable read but by the same virtue the acute glibness of the prose rubs up poorly against the logic of the universe and increasingly dark tone. There is, however, one element that really spoiled the enterprise. Early on we read of Rin’s first menstruation, which is not exactly a common theme even in female-led coming-of-age fantasies. Here was me thinking, initially, that this would be a pointed exercise in representing female puberty in a genre where this is often omitted. Not quite, because we move rapidly to Rin procuring a magical hysterectomy. I was hoping this would be a platform for interesting character development: would Rin champion this as a symbol of autonomy? Would it instead be something rash and regretful? Would it prove a source of persecution in a patriarchal society? Would this sequence have any substantial bearing on any element regarding the characters or world-building in the pages to come? The answer, as I am sure you have guessed, is no. This irks because the logical reading of such a scene, with no narrative pay-off to follow, is that the author thought it implausible that Rin would be a functional protagonist unless her menstrual cycle was exterminated. I do not think most readers think like this, and one should certainly not pander to those that do. This section can be excised with no impact on the wider story. I can’t speak to the author’s actual intent but this does not read well. 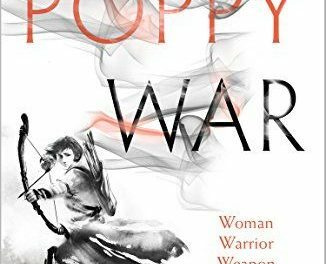 Without the hysterectomy, The Poppy War would be a solid enough debut: a sizeable offering for those looking for dark Asian-themed fantasy with a few growing pains in its writing style. With that perfunctory inclusion though, I have deep misgivings about the ethos of the series.